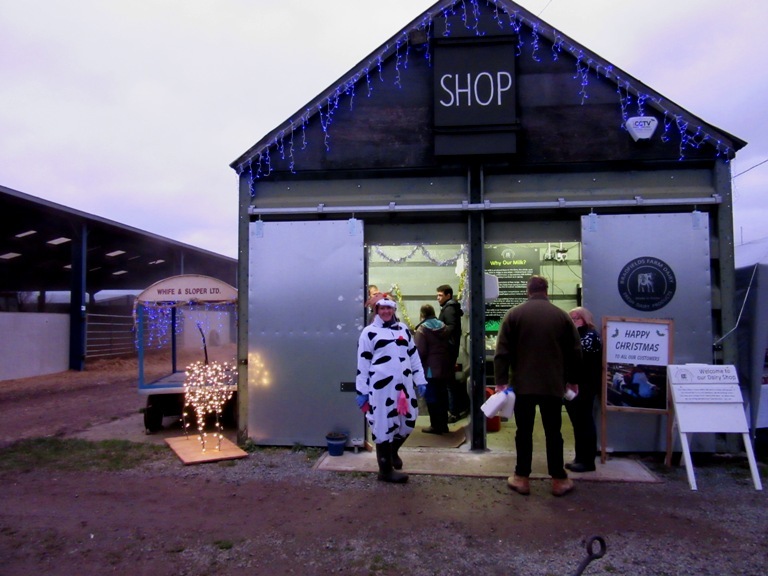 This is will be the second Christmas for the dairy as we have been open for over 18 months now. It’s been a good year for us – we really appreciate your support and hope that you have enjoyed our products over that time. We are finishing off our preparations for Christmas now. All the batches of hard cheese were made some time ago are now maturing in our cheese store. We have two new hard cheeses for Christmas – Bradfields’ Blackwater is a Gouda style cheese and Bradfields’ Chelmer is our first batch of Caerphilly style cheese. Neither of these have been on sale before. Do ask us if you would like to try a sample. 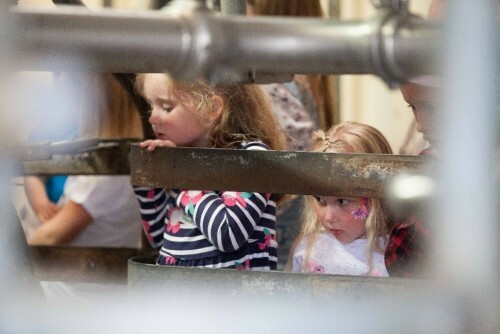 Christmas is a very busy time with all of the products being made but also, on the farm side, the cows need to be milked twice a day every day of the year. They can’t be turned off, so there is no time off on Christmas day. Just all hands on deck to try and finish a little early so we can have family Christmas dinner in the evening once milking is done and the cows are tucked up for the night. 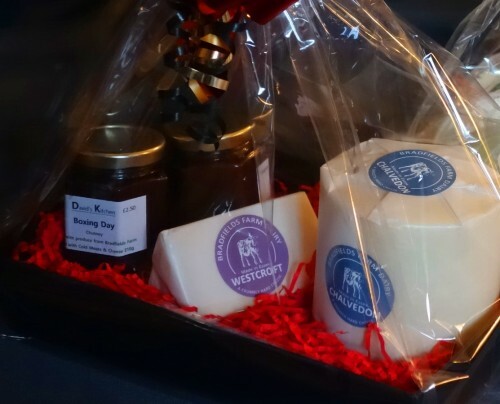 The 17th December is the last day on which you can order cheese if you want any for Christmas. We can take orders for cream up until the 20th. 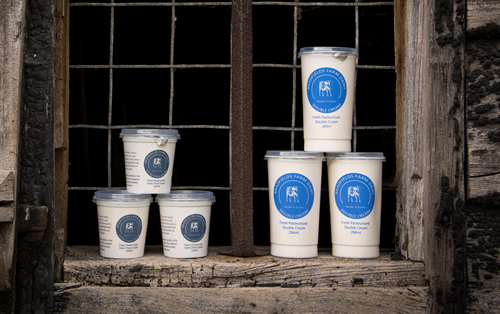 Both Extra Thick and Double Cream are available in a range of sizes, including larger pots. 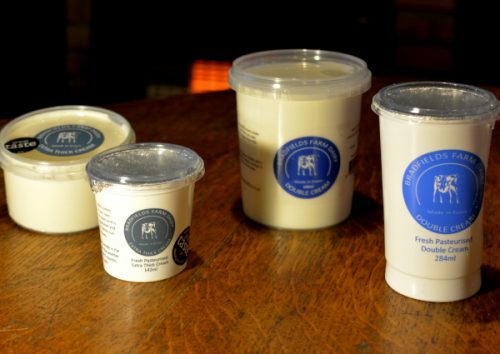 There will only be a small number of cream pots made unordered so if you do want some we strongly recommend that you order some. There is a limited amount that we can produce and we are likely to run out! As we did last year, we have prepared some Christmas Gifts and have put some examples on our Christmas Order Form. 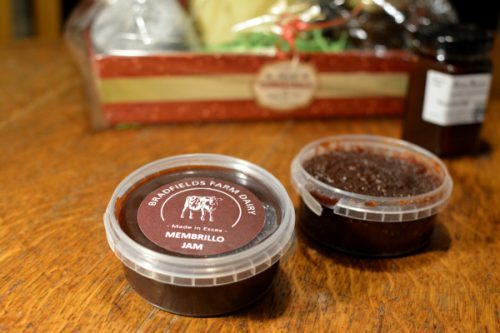 Another new product is Bradfields’ own Membrillo Quince Jam. David’s Kitchen, who makes our chutneys, has made this for us from quinces grown on the Farm. 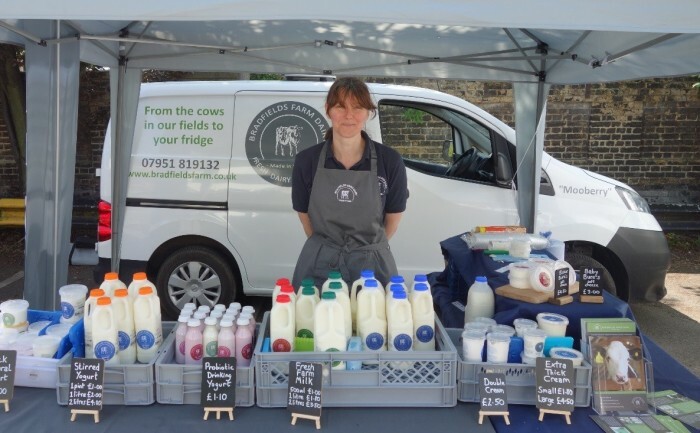 You can place an order by printing off the Order Form and returning it to us, or by emailing the details of what you would like (and when you would like to collect it) to info@bradfieldsfarm.co.uk. 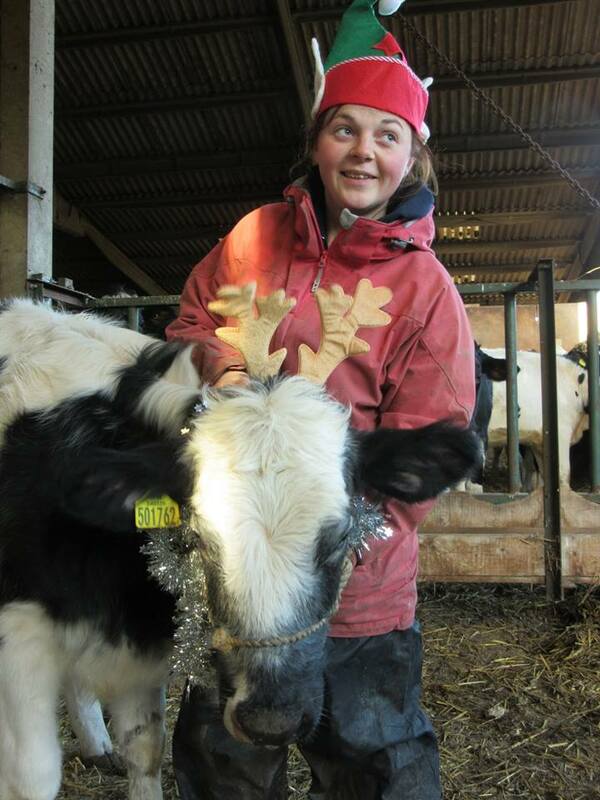 Orders can be collected from the Farm between 10.00 am and 4.00 pm on 22nd, 23rd and 24th December. We will deliver locally on these dates (within 5 miles or so of the Farm) for a small charge of £3 for delivery. Do write this on your order form, or email, if you want your order to be delivered. We will also have a few little bottles of ‘Santa Milk’. 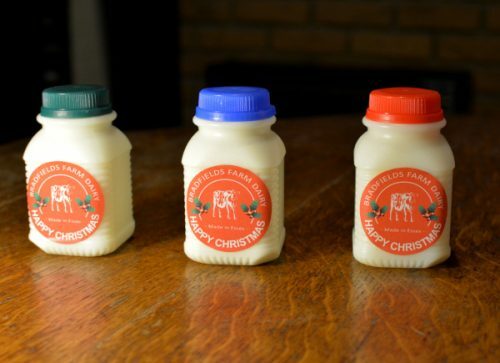 These special little milks are just right for Santa to have to wash down his mice pie. They aren’t on the Order Form as the elves brought them too late for us to put them on. 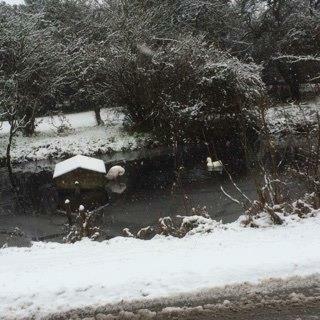 The shop will be open over the festive period so if you do run out of milk you can pop in. We won’t be pasteurising fresh milk on Christmas Eve or New Years Day, but there will still be plenty of shelf life left on the milk available. 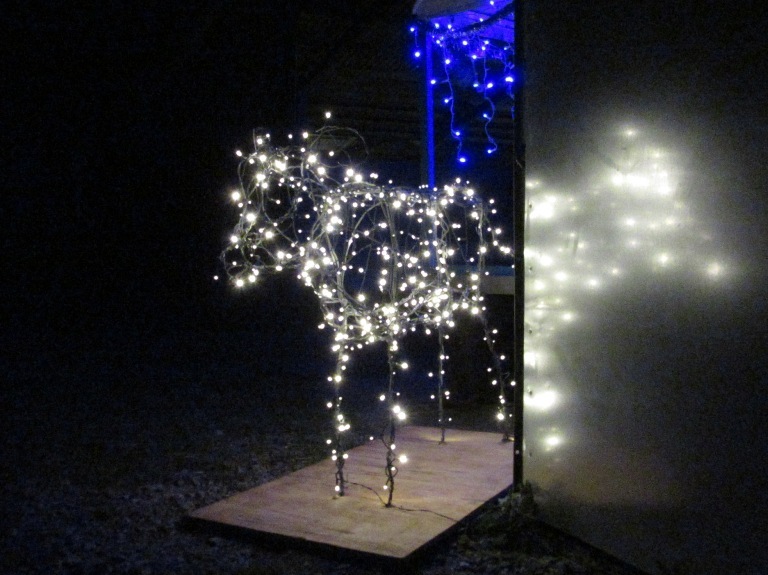 We will get the shop a little more in the Christmas spirit with some lights. They would be up now, but we found that the ones that we have weren’t working. We will have them up soon. It’s been a really busy late summer at the Farm. 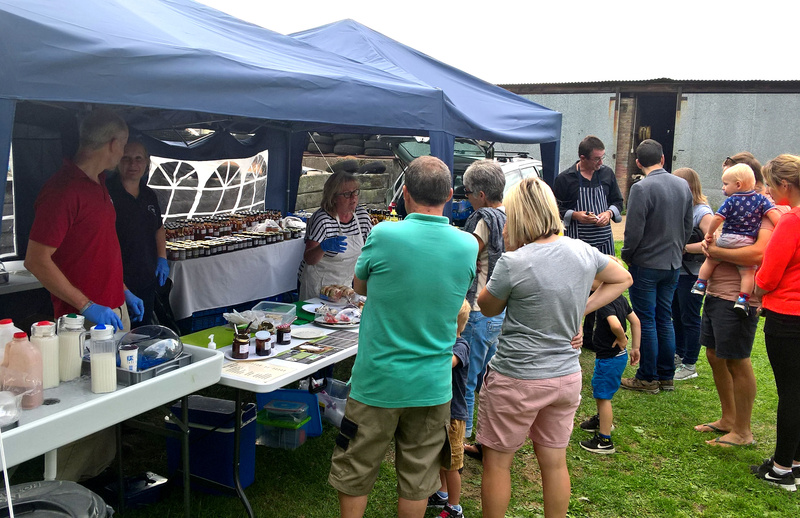 Since Open Farm Sunday and the Orsett Show, we have done the local “Party in the Park” and event at Mill Meadow, Billericay. 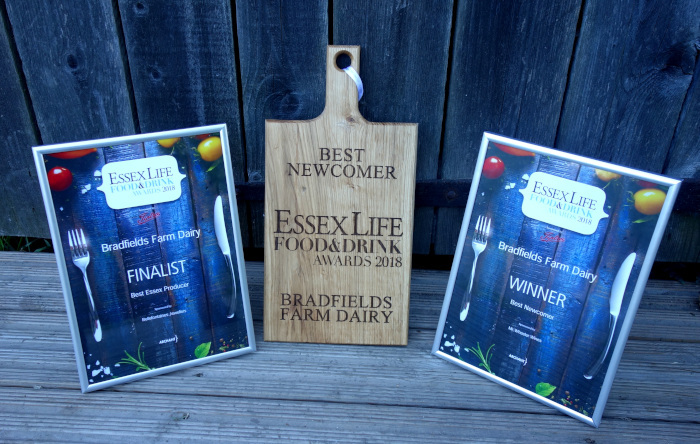 We have made quite a few new products, all of this culminating with our customers nominating us for the Essex Life Food and Drink Awards 2018. 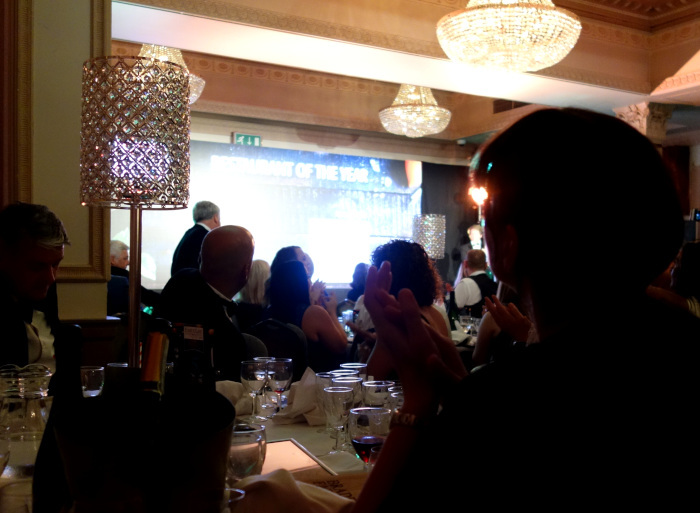 We were very honoured to attend the Awards on the 27th September and absolutely delighted to win the Best Newcomer category. 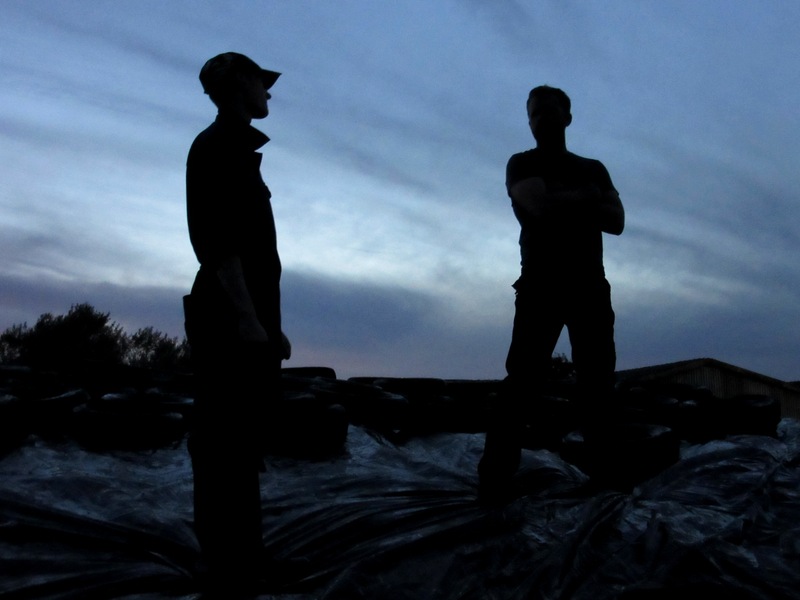 We were pleased, but very surprised, to be one of the three finalists for Best Essex Producer in only our second year. 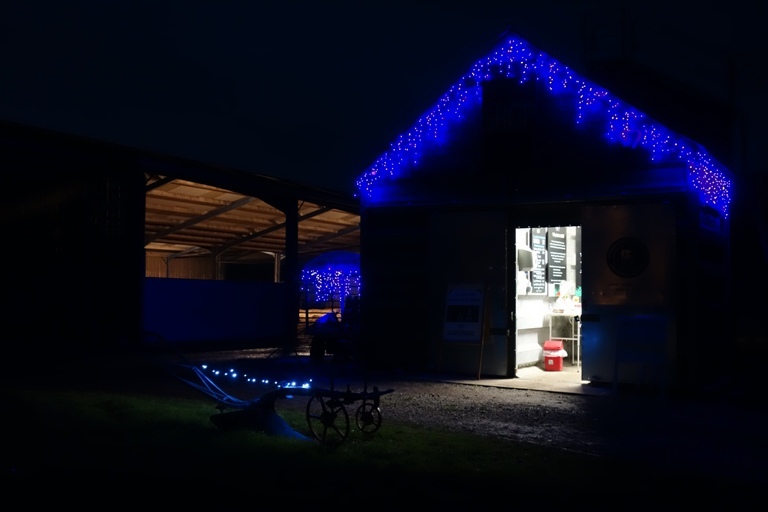 It was a bit strange to see video footage of ourselves on screen during the presentations, but it was a lovely evening attended by quite a few of the farm shops and restaurants that we deliver to. If you will spare us the indulgence, we’ve added quite a few photos of the evening and afterwards. 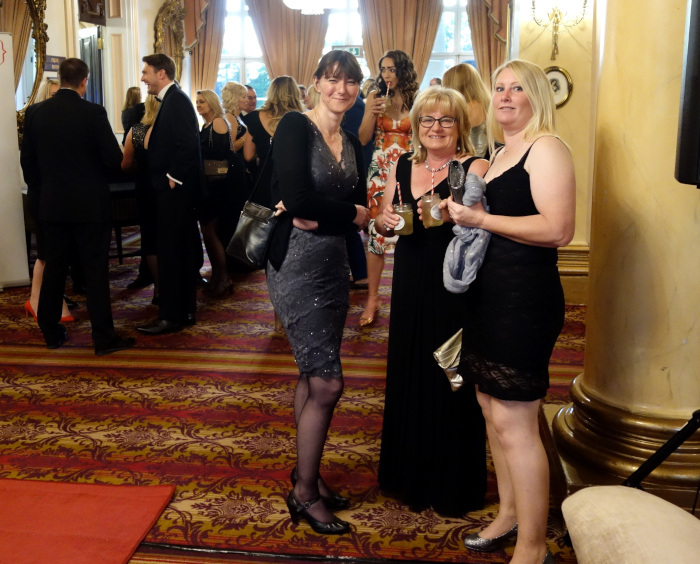 A rarity to be out in our posh frocks, rather than wearing hairnets. From the left below – Clare, Carol and Lynnette. The view from our table. Scarily large screen. 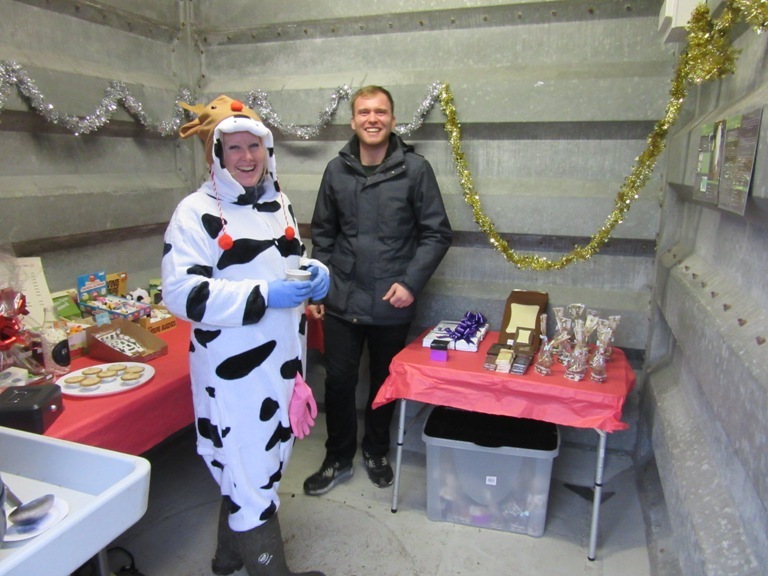 With our awards and banners outside the dairy shop – Lynnette, John, and Clare with William and Chelsea who do the proper work looking after the cows. 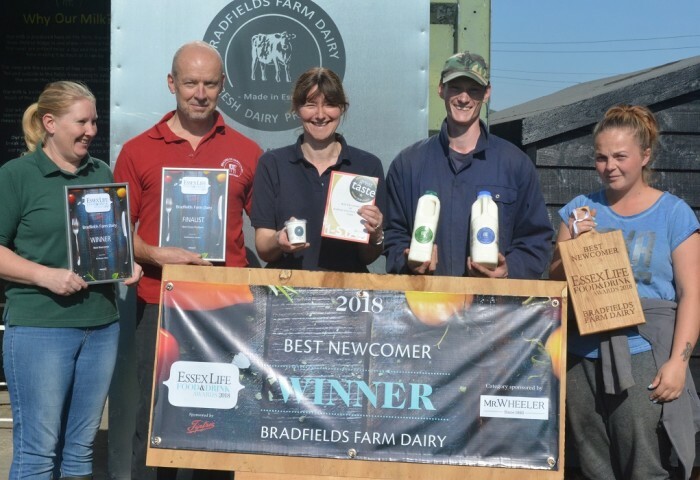 We are also delighted to have been awarded a Great Taste star for our Bradfields Farm Extra Thick Cream in this year’s competition. Receiving a one-star rating means judges dubbed our cream a food that delivers fantastic flavour, simply delicious. 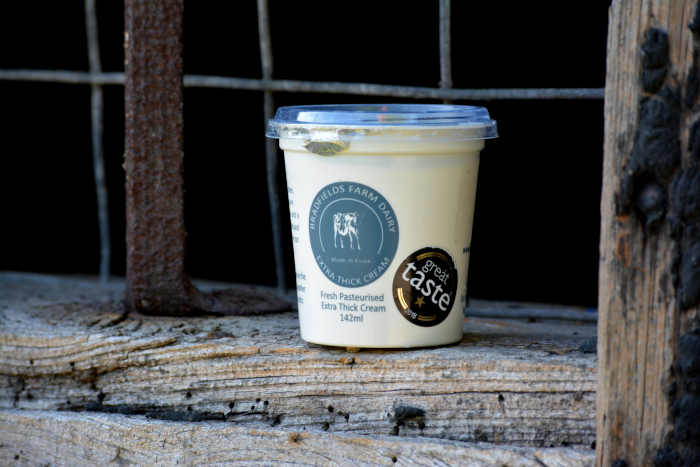 The cream is always on sale at the Farm and has also been on the menu for delicious cream teas at The Barn Restaurant at RHS Garden Hyde Hall. 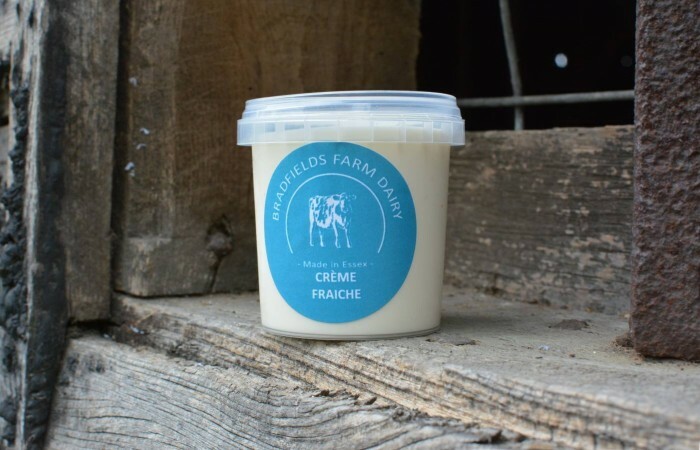 For some time we have been trialling and testing Crème Fraiche, made from our thick cream. We have now settled on a recipe and have small pots for sale. These are 142ml, the same size as the extra thick cream. 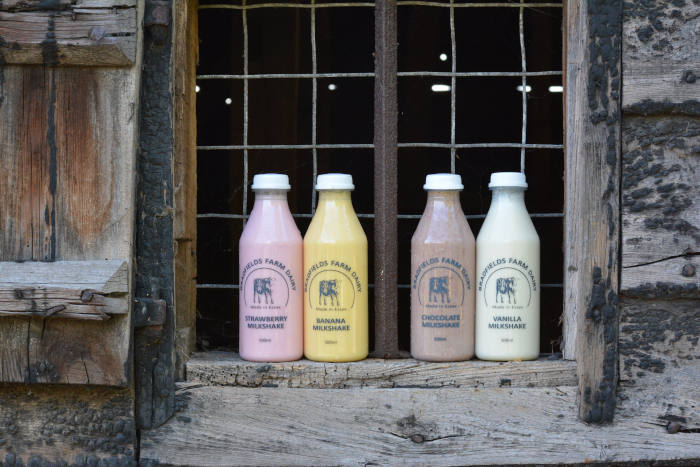 We now have the new printed bottles for our probiotic drinking yogurts and milkshakes. 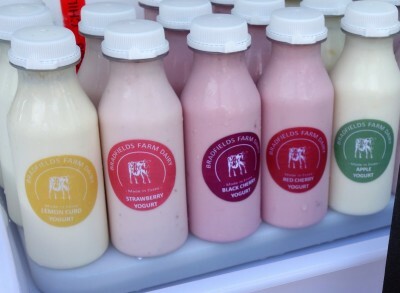 We are looking into options to get these products on sale regularly in our Dairy Shop. We will probably need a new vending machine for this so do bear with us. 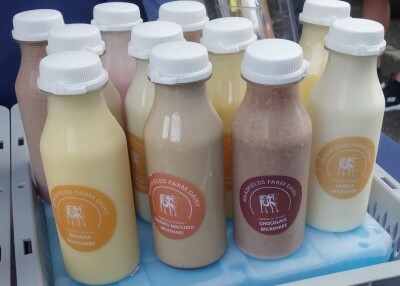 Meanwhile the Crème Fraiche, probiotic drinking yogurts and milkshakes are available by pre-order so do let us know if there’s anything that you would like. 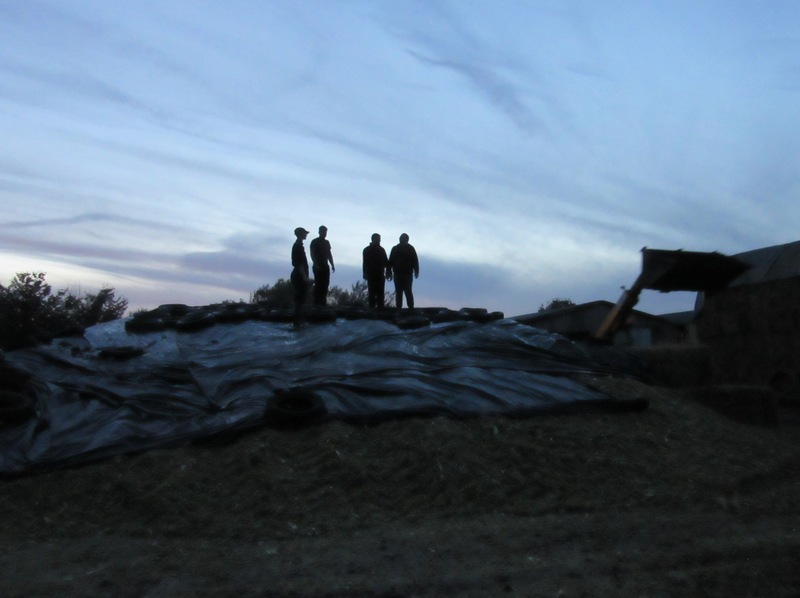 The Farm is now a collection point for Sarah Green’s Organics Vegetable Box Scheme. 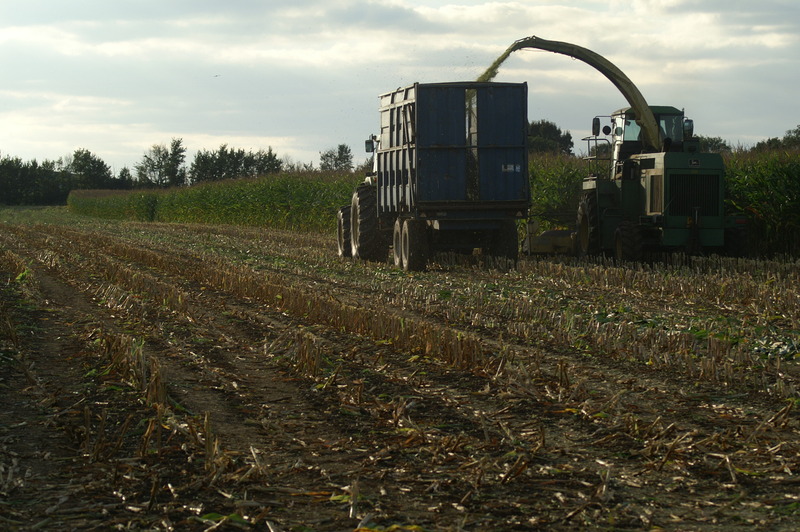 This is a weekly delivery of a wide selection of seasonal organic vegetables grown on their Farm in Tillingham. 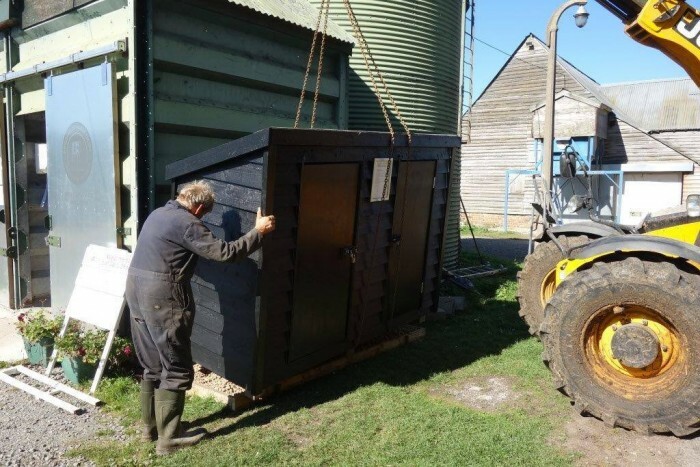 Sarah delivered their lovely collection shed last week, it has now been forklifted into position and is now being used to store the vegetable boxes, ready for collection. You can pre order online at the Sarah Green’s Organics website, so why not check out what they have and register with them. Simply order your veg or veg box via their website and it will be delivered to the collection shed on Friday for collection for you to collect whenever suits you. The boxes can be collected during dairy shop open hours 8am to 6pm. Meanwhile, out in the fields, the occasional downpour and the lovely recent sunshine has meant that there is some nice fresh grass growing for our girls to eat. 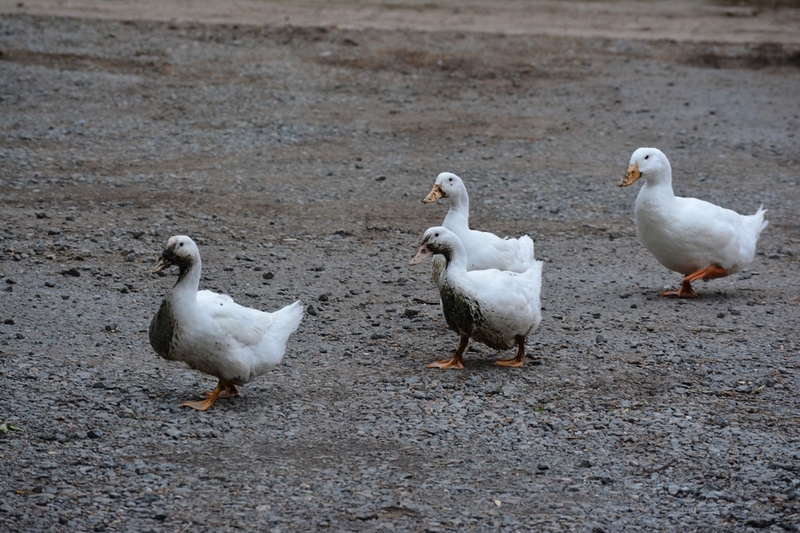 You may have noticed that we have had a lot of ducks at the Farm now. 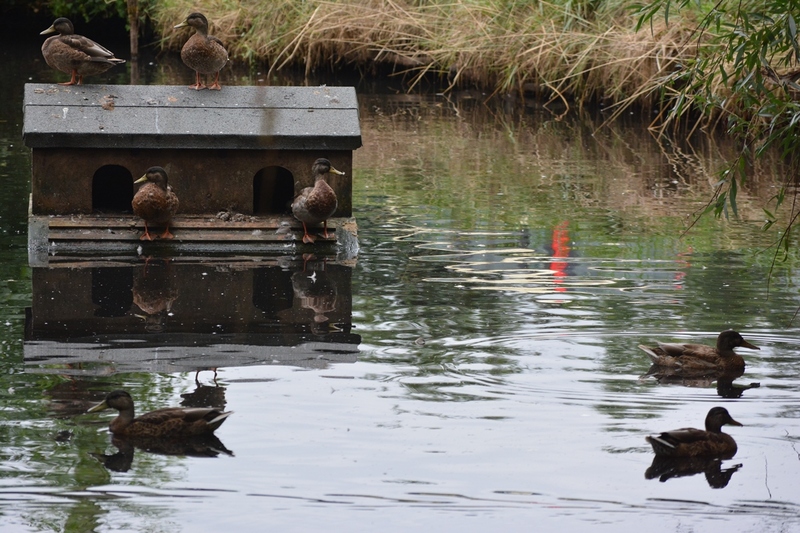 A duck population explosion has happened as Mrs Mallard has had lots of chicks and other mallards have flown in and had chicks of their own. 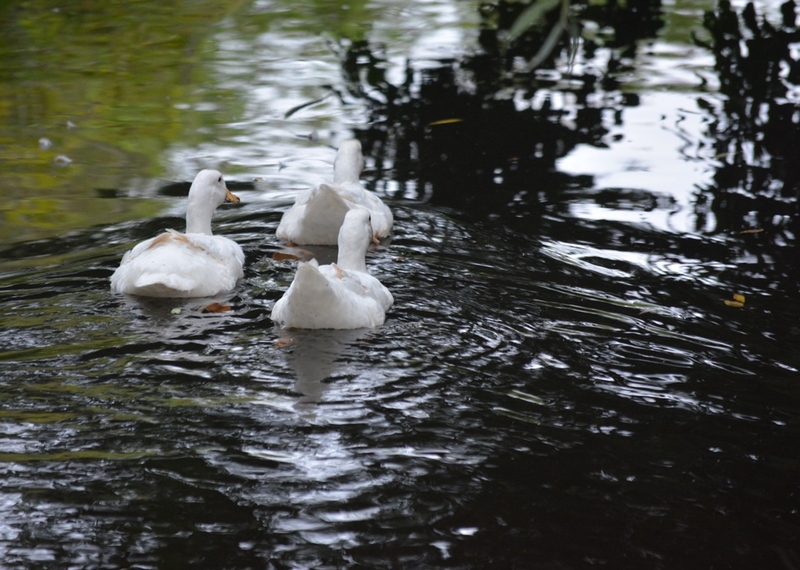 The young chicks soon grow into juvenile adult size birds and we suddenly have a pond full. They do like it here and the constant supply of grain from the nearby hopper certainly helps. 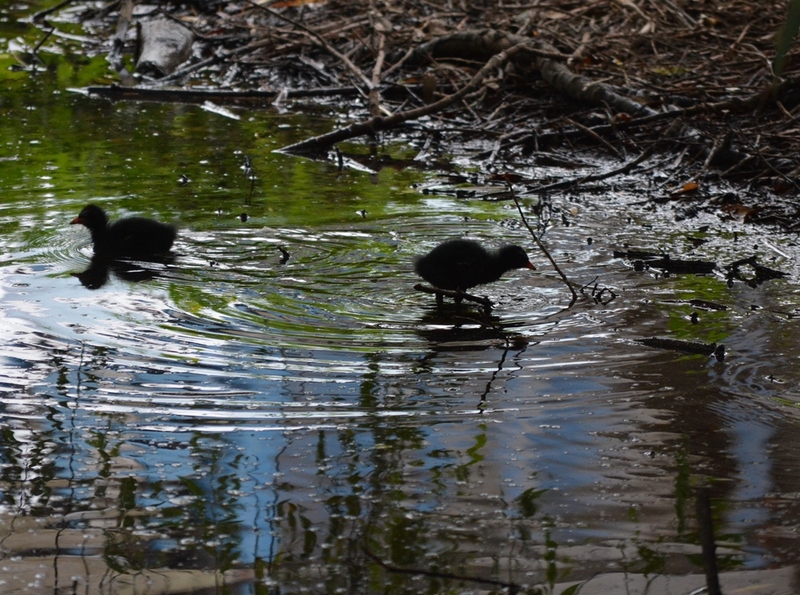 and there are quite a few baby moorhens around at the moment. … but they always wash up pretty well. 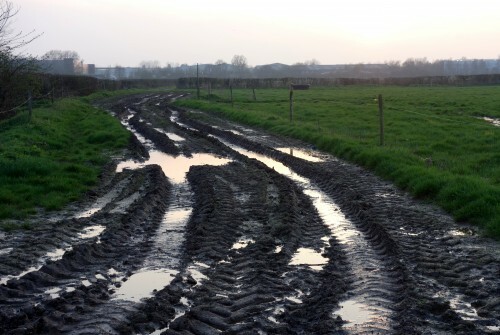 Back in early April in our blog “Can we go out soon?” we talked about the very wet weather, with water bubbling up out of the road drains and the girls not being able to go out into the fields because of all the soggy Essex clay. 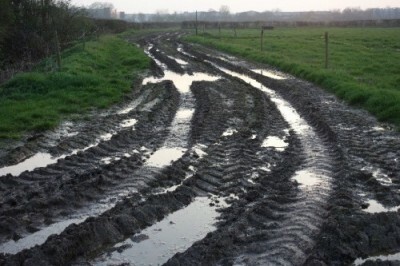 We posted a photo of the mud bound track out to the fields. The photograph on the right shows what it looked like on July 27th, the so called “Furnace Friday”. It’s been the same everywhere. 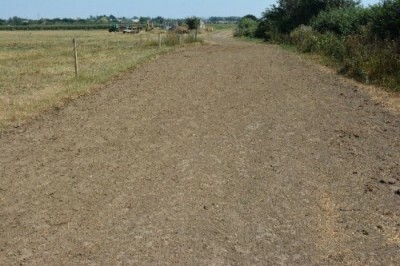 You will notice that there is quite a difference in the grass in the fields. Effectively, there is very little. 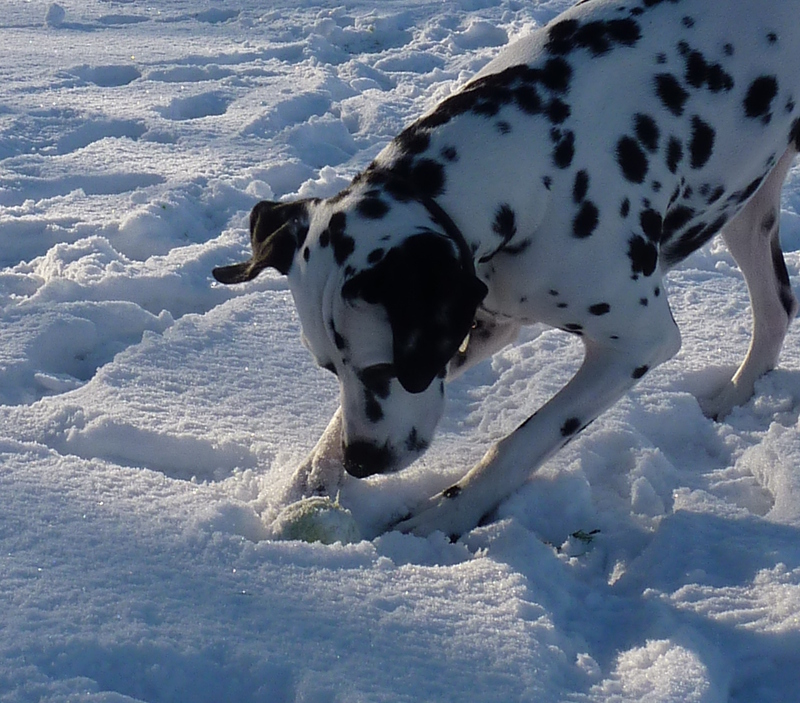 Farmer Nick has been telling people that the cows are on ‘coconut matting’ and just nibbling at whatever they can find. 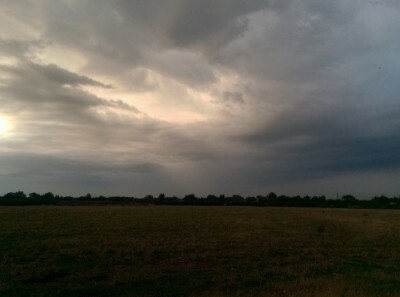 As I write this we have had some storms and some some sustained rainfall. 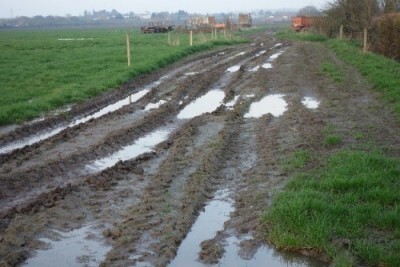 Even with this we, like all other dairy farmers whose cows rely on outdoor grazing, can expect further tough times ahead. 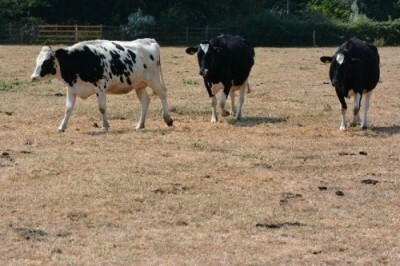 The cows would normally be enjoying a large proportion of fresh grass at this time of the year. 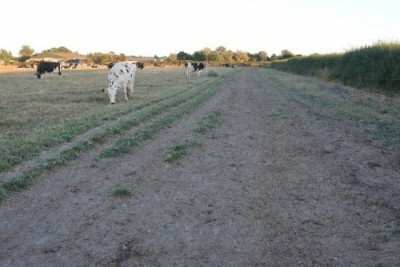 Grass would still be growing and the cows would be enjoying large amounts of it as a big proportion of their diet during the summer months. 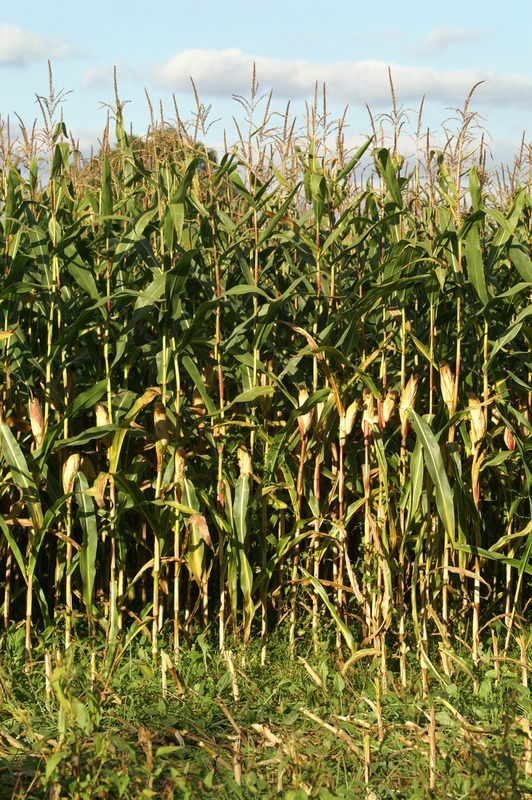 Also, we would expect the make a second cut of grass sileage during the summer. 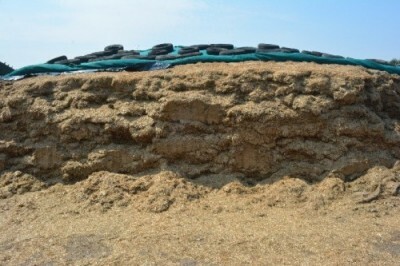 Not only in this unlikely to happen, with the result that there will be less to feed to cows during the winter months, but also we are now having to use the sileage that we cut in the spring. 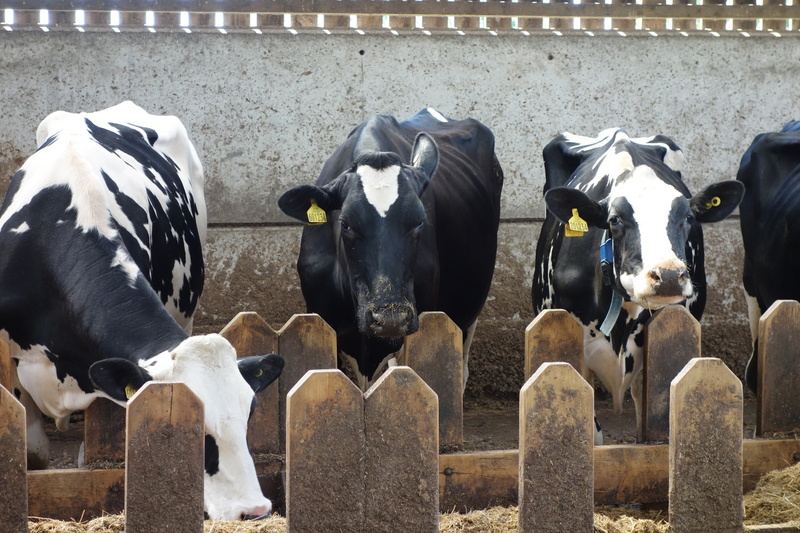 The cows are eating 90% of the ration that they would eat in the winter (mainly sileage) a day at the moment. 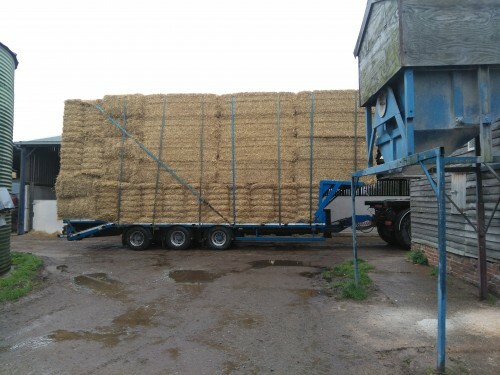 The clouds have been gathering and we are hoping for further sustained rainfall, ideally after we have got the straw off the fields. It has been such a busy summer at the Dairy. As well as experimenting with a new more crumbly version of our hard cheese, which we have been maturing over the last few months, we have been spreading out a little further into Essex. In July we have started supplying White Elms Farm Shop at Bicknacre. 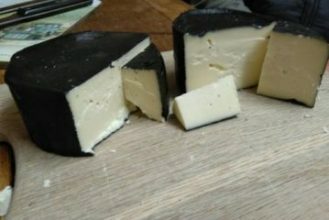 Our Baby Bure’s soft cheese has joined the summer menu at the Purleigh Bell pub and we are now supplying them with our fresh milk too. 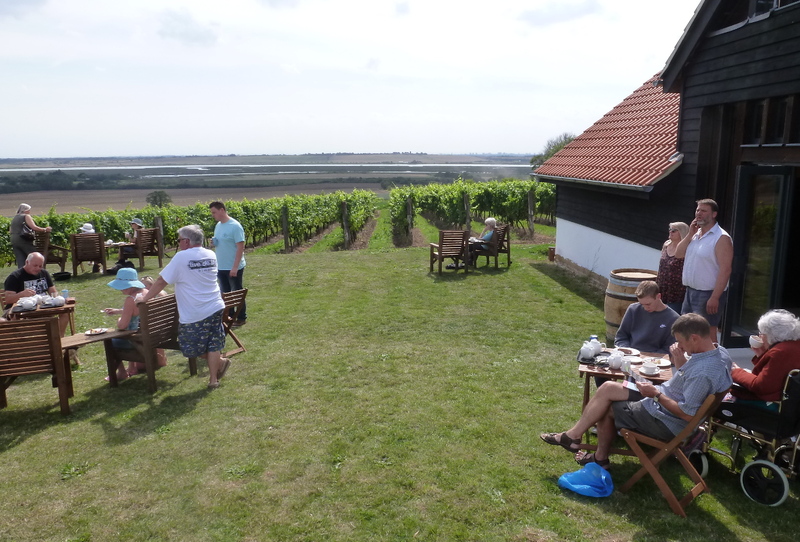 And Clayhill Vineyard has joined us too, using our milk in the café and the extra thick cream for their cream scones. 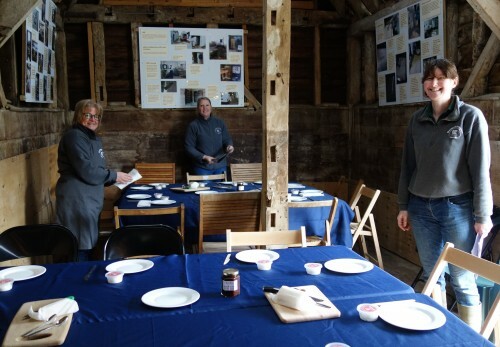 Back at Open Farm Sunday in June we met David’s Kitchen a local chutney and chilli maker. In July we caught up with David and since then he and Carol have been busy picking apricots, pears, plums and greengages from the Farm’s garden orchard to make a range of chutneys and jams specially for us. 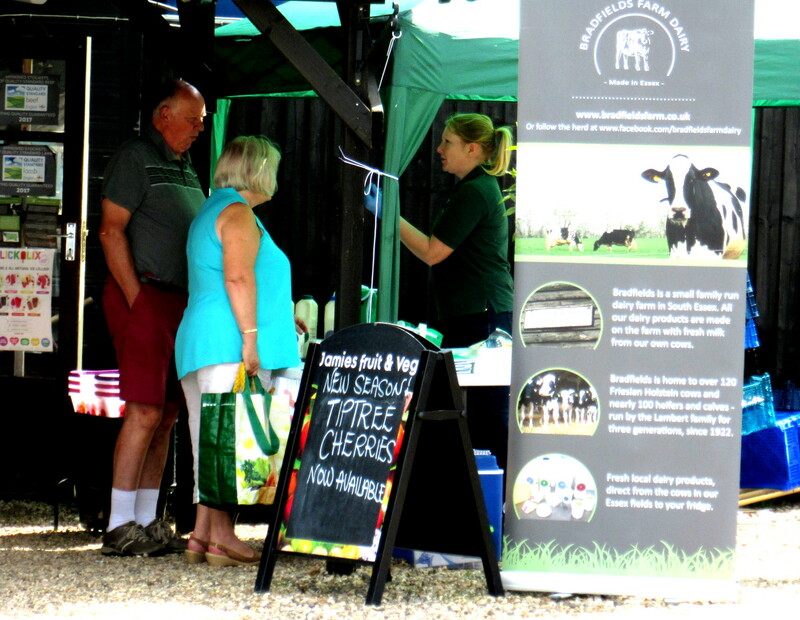 David joined us for our first Cheese and Chutney Weekend in August and we had a little mini open weekend where everyone could meet some of our calves as well as see the cows. 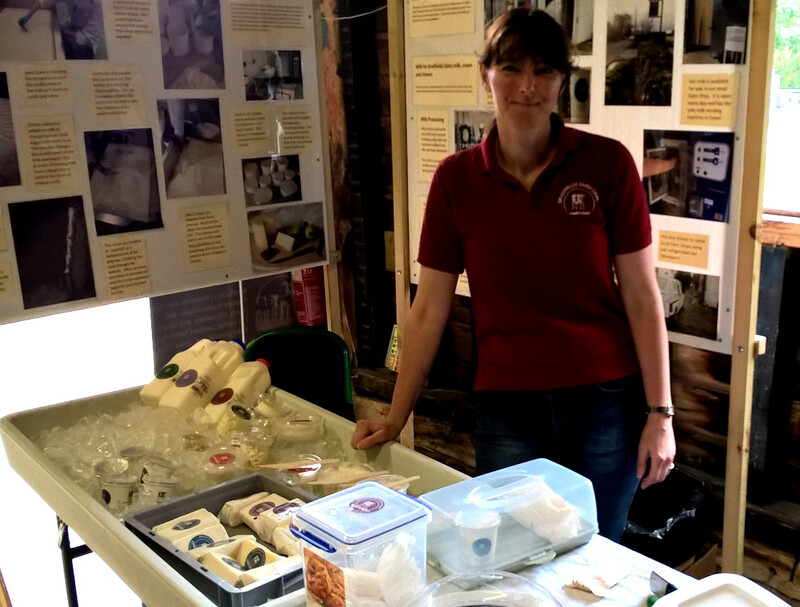 We have been out from the farm much more this month, running cheese tastings at Bicknacre and last weekend we managed to spread ourselves around three events. 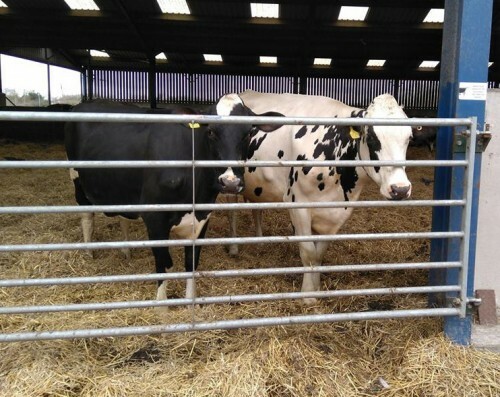 We joined the agriculture tent at Orsett show, with a display on the cows and calves, cheese tastings and taking more of the milkshakes which were so popular at Open Farm Sunday. It was a fantastic day for us at the show. We were busy all day talking to people and giving out plenty of cheese samples. Then we split our resources to take part in the Bowers Gifford Picnic in the Park. 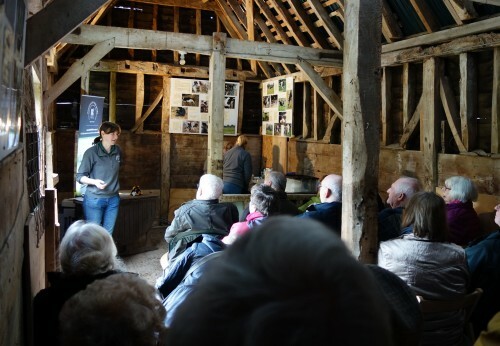 It was lovely to do an event so close to the Farm and it was a great afternoon there. Lynette and Carole manned the Picnic. 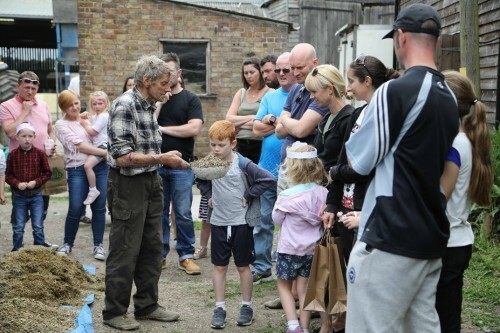 John went over to Thames Chase Community Forest at Broadfields Farm near Upminster to join in Harvest Home, their celebration of farming, another great event and a brand new audience for the Dairy. I ran between the two to set up while keeping an eye on our own dairy shop. Overall the busiest weekend we have ever had. 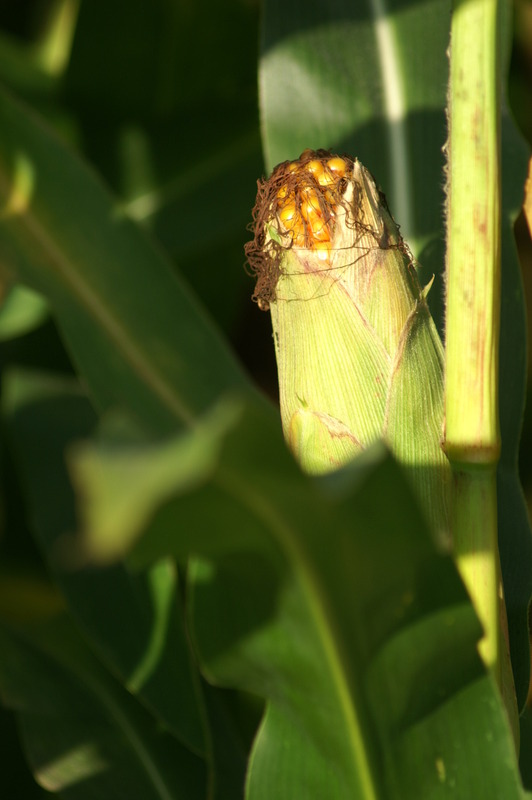 July and August have been just as busy on the Farm too. 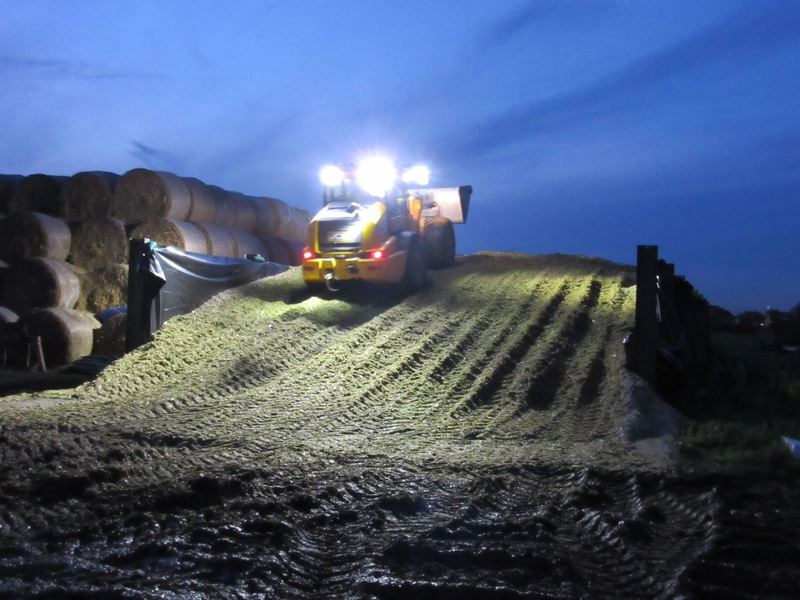 The usual cow work joined by second cut silage, harvest and carting hundreds of bales of straw from other farms in south Essex so we have enough winter bedding for the girls. 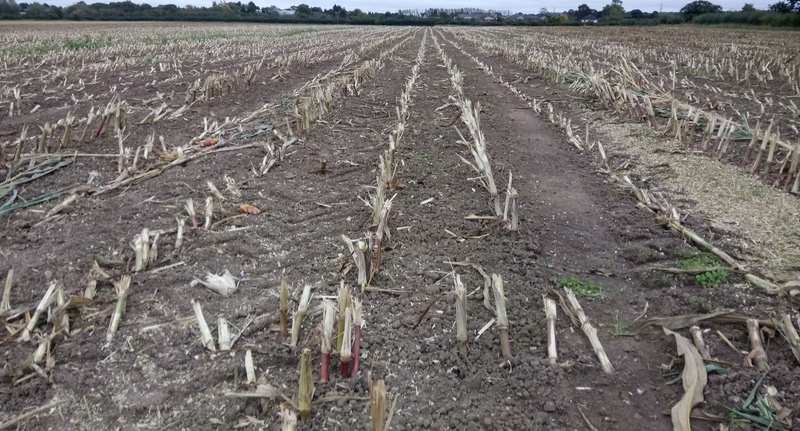 Now we are cracking on with autumn cultivations, spreading all the dung from the winter barns on to the fields ready to be ploughed in. 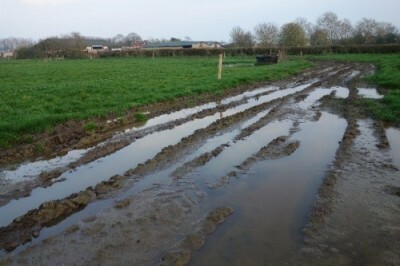 We are not organic but we do try to use as much of our own natural fertiliser as we can on the fields. 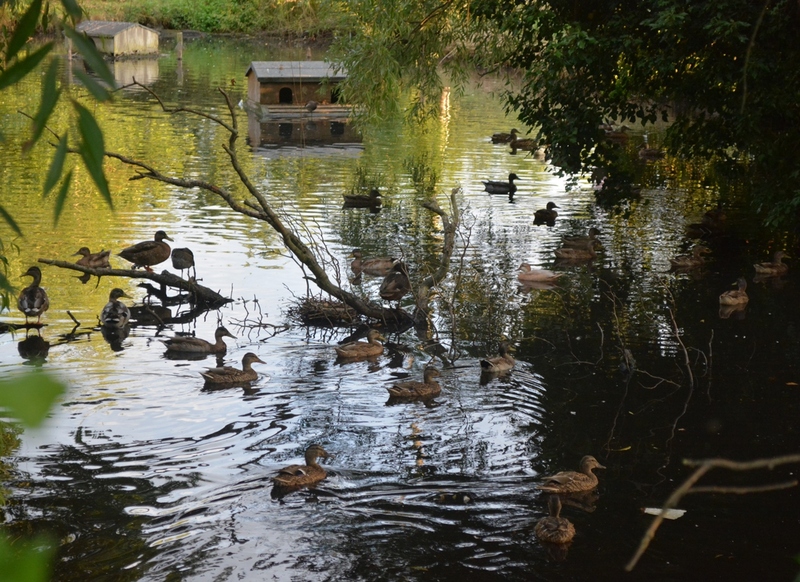 All the animals are readying for autumn, the squirrels are in the garden constantly stocking up and Mrs Mallard’s babys are nearly full grown and have lost all their fluff. 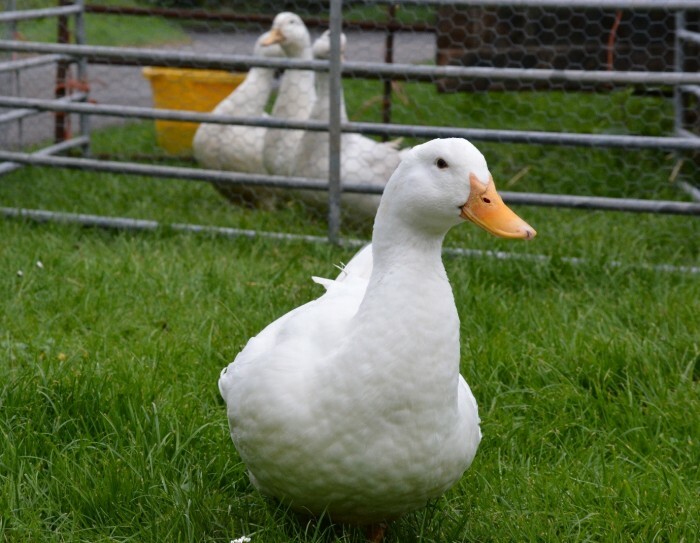 Our very naughty white ducks, who joined us in June, from a school via Nicky, have taken over the farm completely, popping up all over the place, constantly talking to each other and chasing others away from their favourite spots. 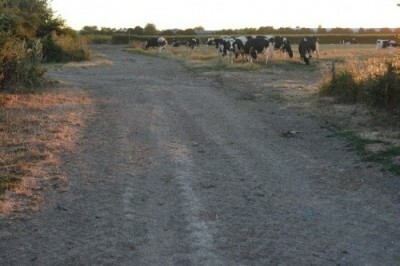 They waddled down the cows feed strip last night and have even been seen in the milking parlour. We have more planned for September and lots of cheese making this month to get cheese matured in time for Christmas, which will be with us before we know it.